If you are looking for a slot that delivers a nostalgic feeling of playing on the video slots in a casino floor then Monty’s Millions is a vintage slot that you are looking for. 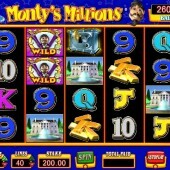 Monty’s Millions is a 5 reel, 40 pay-line slot from reputed slot developer Barcrest that started life as a land-based video slot but has now made its way onto the online platform giving players across the globe the chance to enjoy its gameplay. The game revolves around the extravagant millionaire Monty. Symbols in the game consist of all the expensive things that Monty can afford including a car, mansion, bank notes and bars of gold. This slot is about the rich and the fabulous so if you have an objection to rich people flaunting their money in front of you then you might not get along with Monty! The Wild symbol in Monty’s Millions is represented by Monty himself with the word “Wild” emblazoned on it. This symbol substitutes for all other symbols except the scatter symbol within regular gameplay to complete winning combinations. The scatter symbol comes in the form of the safe icon. If you hit three or more of these scatter symbols across the reels then you will trigger the free spins bonus round. You will be awarded with a minimum of 5 free spins when this feature is triggered and you will earn a 2x multiplier. It is possible to re-trigger the free spins during this bonus feature if you hit three or more of the scatter symbols during the free spins. Monty’s Millions is vintage slot gaming stripped back to its wonderful basics. You have a cheesy lead character in Monty, a lavish theme, Wild symbols that can randomly increase your winnings and a simple free spins bonus round to win some big prizes. Monty’s Millions does not have the mind-blowing 3D graphics of Sheriff Gaming titles such as the haunting Midnight Rush or the futuristic The Robets. However, it does have genuine appeal in its raw nature and simplicity. It is this sort of title that has helped make Barcrest such a respected developer in the global market.